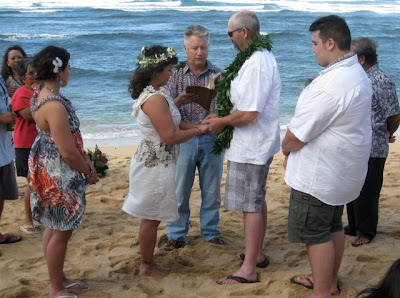 My nephew and his wife renewed their wedding vows on a Hawaiian beach for their 25th wedding anniversary. Maria grew up on the North Shore of Oahu, and her childhood friends organized the event. 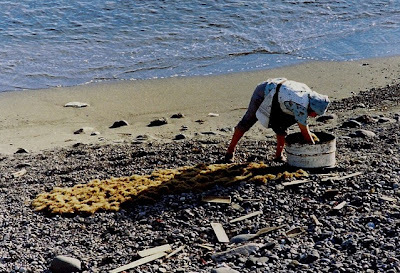 She left the island nearly 28 years ago, but she maintained contact with some of these friends. 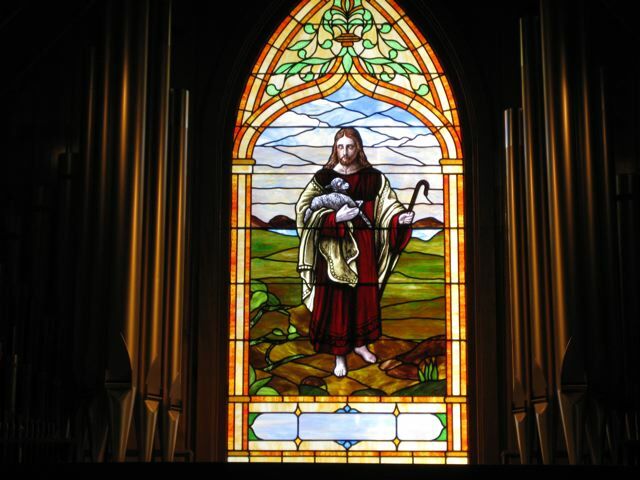 The vow renewal provided an opportunity for a reunion. The food served after the ceremony was tasty and plentiful. Sorry, I don't remember the names of these dishes, but from top left they included, raw fish in a sauce, a salmon/tomato salad, pork wrapped in some kind of leaf, steamed rice, pulled pork, and clear noodles with chicken. Hawaiian appetizers started the meal, and several desserts (red velvet cake, coconut pudding, cheese cake) completed the feast. 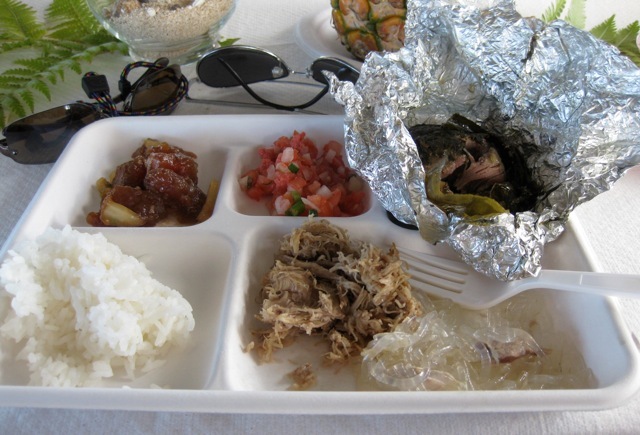 The ceremony, visiting, and meal were great ways to begin the week in Hawaii. It's hard to believe that two days ago I was lounging near the beach without a care in the world. 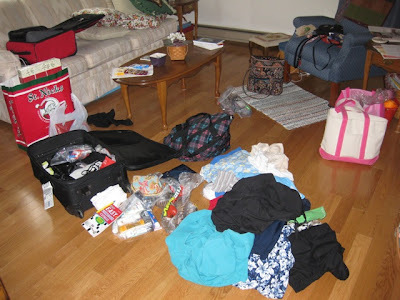 Today, I deal with the piles of laundry. Photos of the trip and details to be posted soon. 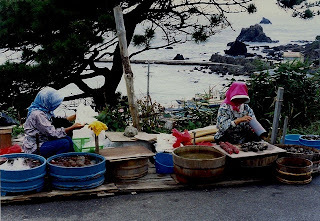 I tried a lot of different foods when I lived in Japan: squid and horse were perhaps the strangest. All of the blog chatter about sock knitting has motivated me to get busy and make some socks for myself. The KAL was designed to knit a pair of socks on one set of circular needles; however, I prefer to knit each sock on its own needles. 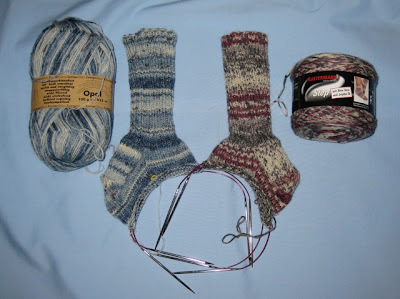 For me is is just easier to handle the socks/yarn separately. These are basic ribbed-cuff socks (I like the fit) and knit of size two needles out of Opal and Step Austermann yarns that I've had for several years. 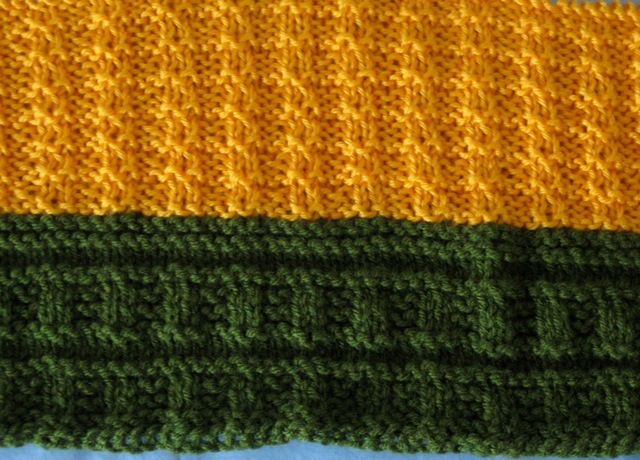 Both yarns are superwash wool, but the Step yarn contains aloe which makes the yarn even softer. 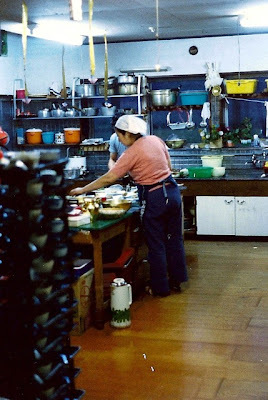 In the late 70s and early 80s most Japanese roofs were blue or red metal which made for colorful photos. Watching waves lapping the shore is calming. 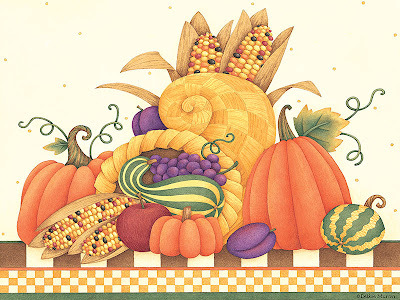 Want to bring some Thanksgiving and Christmas decor to your computer desktop? 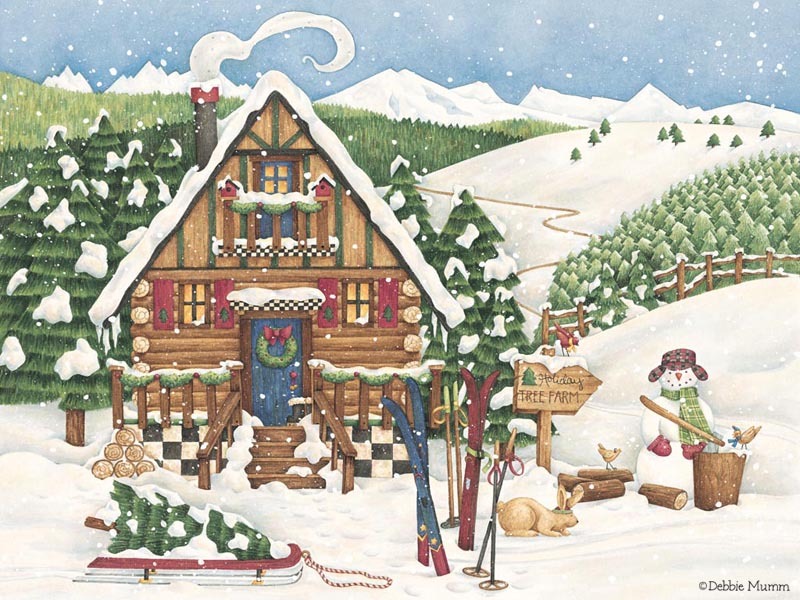 If you are a fan of Debbie Mumm, you can find some wonderful desktop images on her site. 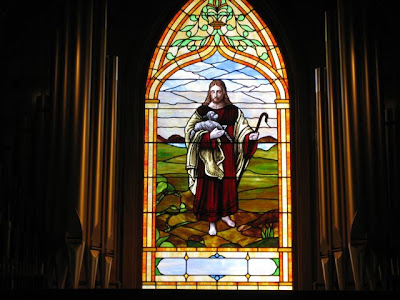 The images are offered in three different screen sizes. 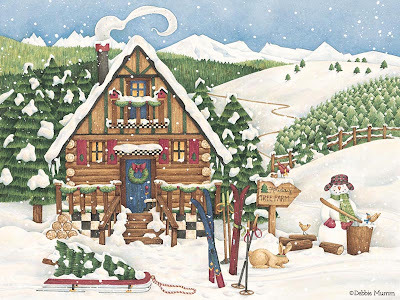 If you are not in the holiday mood, other fun images are available. The site also has free projects for quilters, general crafts, scrapbooking, sewing, and home decor. 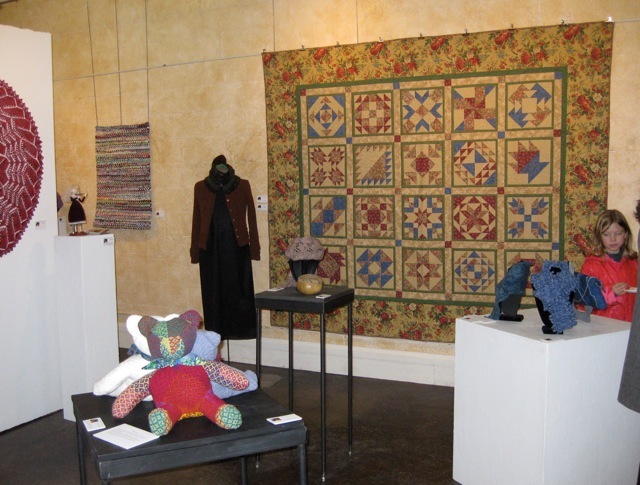 Friday was Opening Night for the Fiber Guild Show at the Lander Art Center. Beverages and appetizers were available, and a small combo provided music. 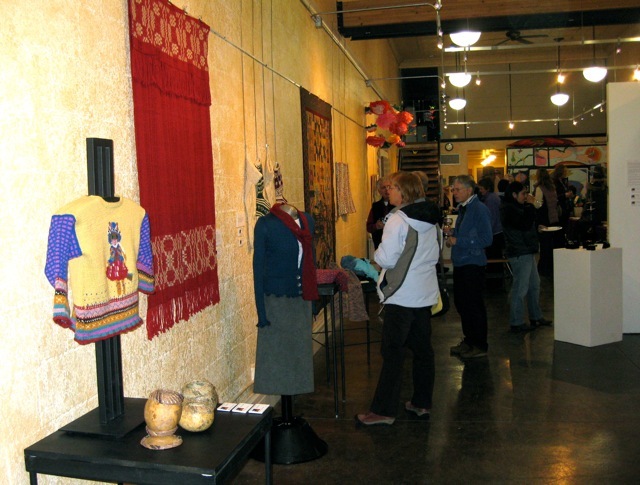 A good-sized crowd mingled among the displayed items, admiring the variety of talents and reading the information provided by the artist. I selected four items to be included in the show. Yes, that is my quilt, Duluth Stars, and twined rug (#24) hanging behind these two women. Down the Garden Path and another rug (#23) were displayed on the facing wall. 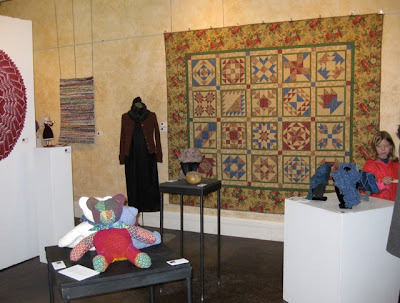 It felt so good to see my items being displayed in the gallery. The Hers and His Aran Stockings were purchased by someone at the opening. How exciting is that? If you want to see the other items on display, they can be viewed Tuesday - Friday (10 AM - 5 PM) and Saturday 10 AM - 3:30 PM until December 17, 2010. Stop by if you are in the area. Friday's paper had an interesting headline: White pages head for graveyard. It was reported that in the past month alone, New York, Florida, and Pennsylvania approved Verizon Communications Inc.'s request to quit distributing residential white pages. Telephone companies argue that most consumers now check the Internet rather than flip through pages when they want to call someone. "Anybody who doesn't have access to some kind of online way to look things up now is probably too old to be able to read the print in the white pages anyway," joked Robert Thompson, a pop culture professor at Syracuse University. 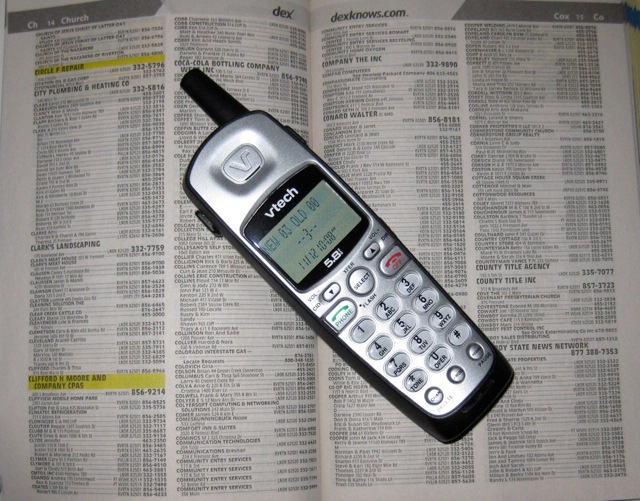 The article continued, fewer people rely on paper directories for a variety of reasons: more people rely solely on cell phones, whose numbers typically aren't included in the listings; more listings are available online; and mobile phones and caller ID systems can store many frequently called numbers. My community's White Pages section is less than a quarter of an inch thick, but I use it frequently. I use the Internet daily and have used it to find a number of a business in another community, but I have never looked online for a local, residential phone number. Yes, my phone has caller ID, but I don't use it as a phone book. Call me old-fashioned, but I hope my community's White Pages do not disappear. Would you miss the White Pages if they were no longer printed? 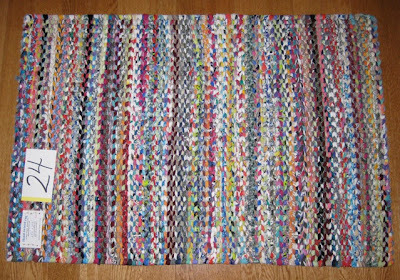 Last week I finished a rug which had been on the frame for over a month. 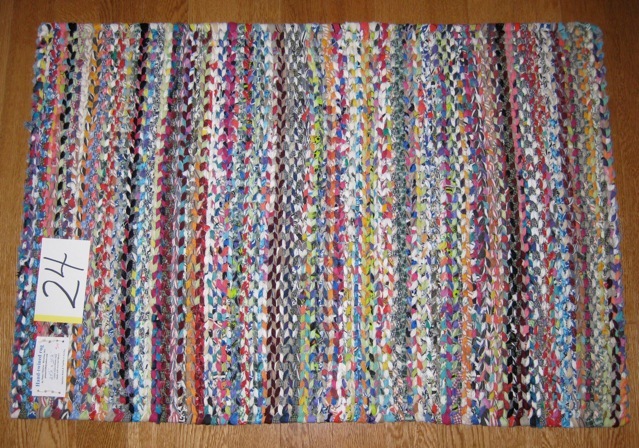 This rug, the twenty-fourth that I've twined, will be in the Fremont County Fiber Guild show at the Lander Art Center. Some of the Guild members' items will be offered for sale. 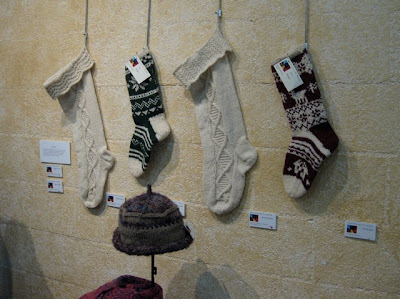 The His and Her Aran Christmas stockings, two rugs, and two quilts (Duluth Stars and Down the Garden Path) are my contributions to this year's show. While I love twining the rugs, I detest the mess that they create. Literally every surface in my house was covered with a layer of lint which the fabric strips slough off during the twining process, and all I seemed to do when I attempted to clean was move it around to another spot. Friday and Saturday I battled the elusive lint, and now the house is nearly lint free. 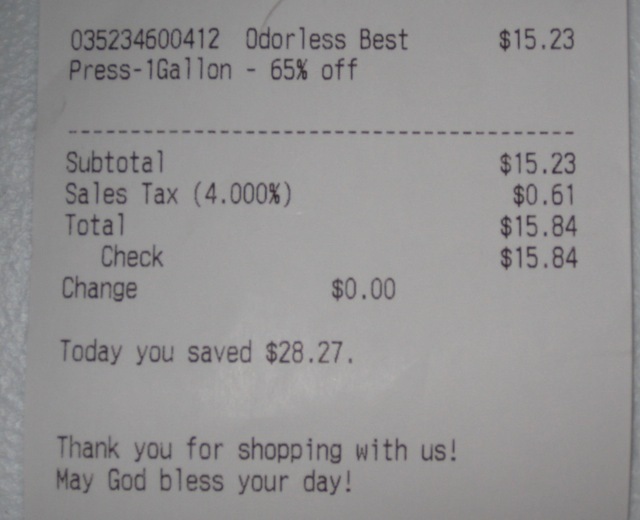 I love Best Press, and I've learned in order to save money to purchase it by the gallon. Last week when Sue and I were at Sheep Camp Quilts, I asked Stephanie for a gallon of Unscented Best Press. She returned from the storeroom with a damaged bottle that was over 3/4 full and offered it to me at 65% off. I jumped at the deal. I was thrilled to have saved so much on a product that I love, especially when a 16.5 ounce spray bottle sells for $7.95. 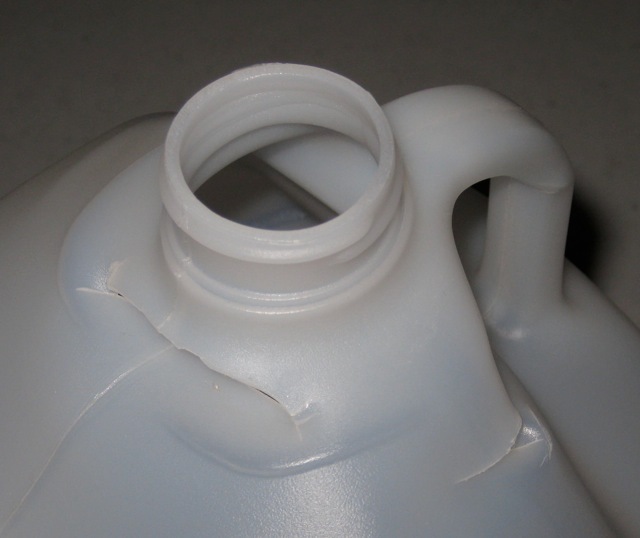 It was a bit interesting to pour the liquid out of the damaged bottle, but I managed to get most of it into my nearly empty container. 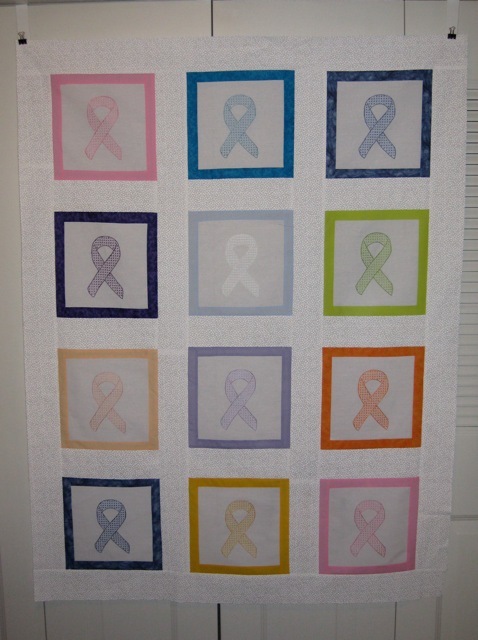 Sue and I took the finished Cancer Awareness top to Sheep Camp Quilts and made arrangements to have it quilted with a ribbon pantograph. 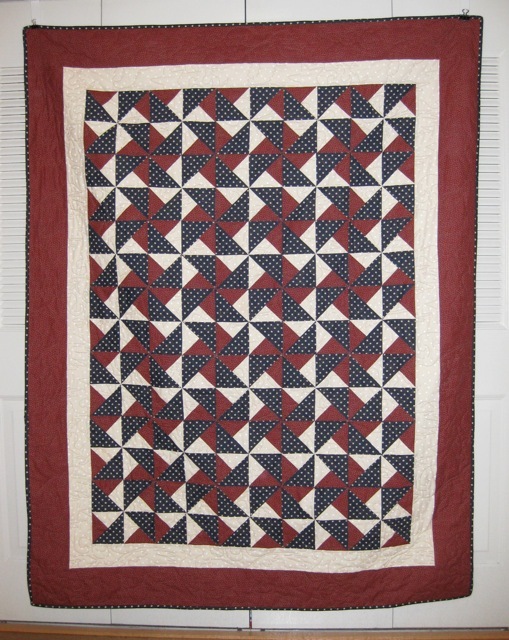 The owner of Sheep Camp Quilts offered a discount on the quilting which we gladly accepted. However, due to a family, health issue the top may not be quilted until the end of December. One weekend a large group of teachers loaded two cars and a van to tour the west coast of northern Japan. 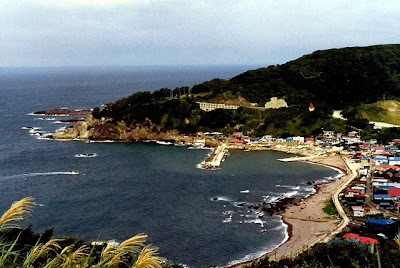 We stayed in local ryokans because they were inexpensive and because they offered a taste of Japanese culture. 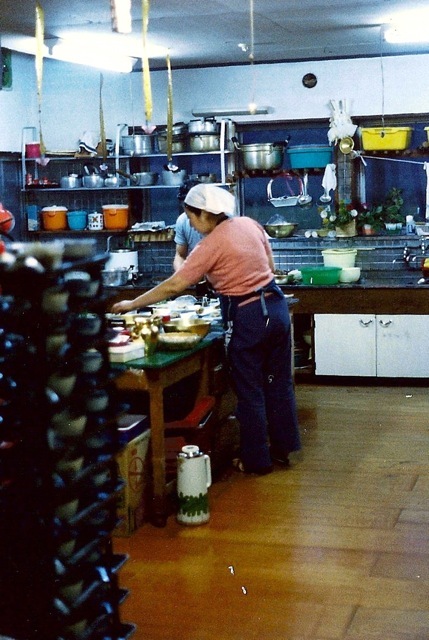 We slept on futons unfurled on the tatami floors, bathed in the common baths, and dressed in yukatas (cotton kimonos) before we ate a traditional Japanese meal. 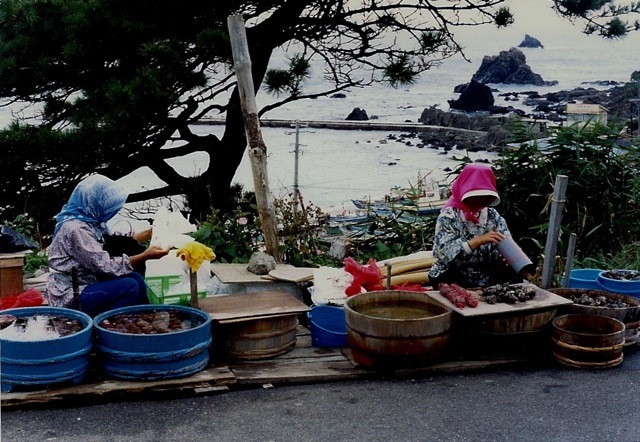 A ryokan is the best way to experience authentic Japanese food and tradition. 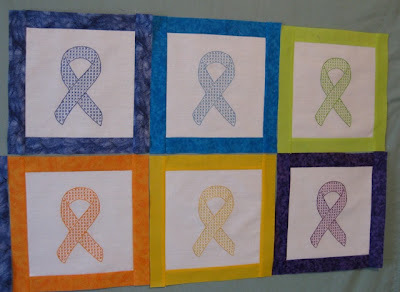 My friend, Sue, embroidered these awareness ribbons to raise cancer research funds and asked if I would sew them together. 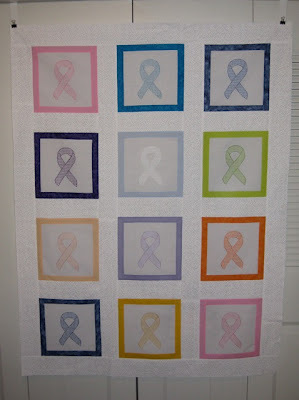 This will be a small quilt (12 total blocks) with ribbons representing the varieties of cancer. The blocks will be separated with white sashing. The pumpkin patch is growing! 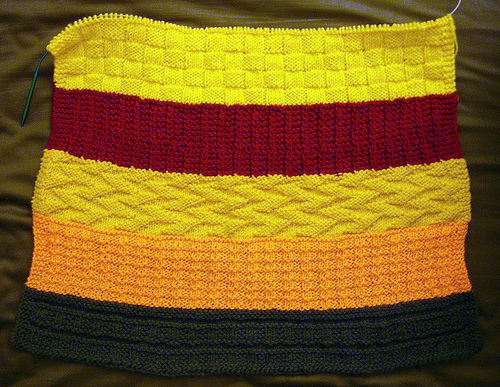 Pumpkin Patch II is an Oddball Baby Blanket for the West Coast/Central group. 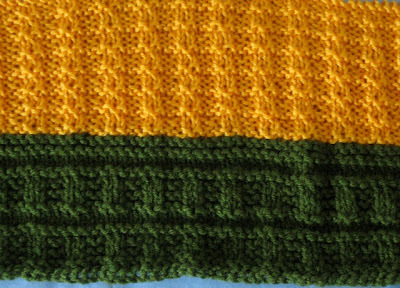 I used Caron Simply Soft (Mango) and knit the Checks and Ridges stitch on size 9 needles. Pumpkin Patch II is nearly finished. In the Wind has been quilted and is on its way to Alycia for distribution. 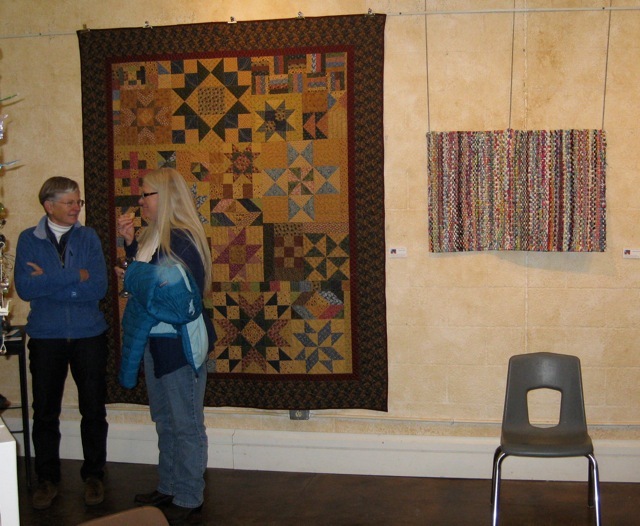 Cheryl (Cottonwood Quilting) in Elk Mountain, WY was the volunteer machine quilter. She used a flying eagle and star pantograph. Thanks, Cheryl. Alycia shows In the Wind on her blog, Alycia Quilts.